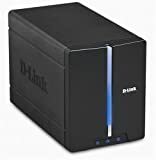 Sneakily disguised as a plain black box with a few blue LEDs on the front of it, the D-Link DNS 321 really exceeded our expectations in terms of quality and performance. If you don’t mind, we may as well spoil the best part of the device in the introduction. The price of the D-Link is what really caught our attention. For what’s included, you can’t beat this device for right around $100. While there aren’t any hard drives included with the NAS, that’s not a problem. Let us explain. What may be a turn off for some, we actually thought was quite clever and responsible on the part of D-Link. A lot of NAS device companies will include hard drives within their device to increase the price and make a little extra money on the price of the drive within. Not only do you not get to pick what type of hard drive you want within your NAS, you typically end up paying too much for it no matter what. To solve this problem, D-Link simply includes 2 hard drive bays to install whatever hard drive you’d like. We recommend going with green energy drives for this device, as because while D-Link has the best intentions, fast spinning desktop computer hard drives just don’t make much sense. Because you’ll only ever be accessing a few files at once and not running a feature rich operating system like Windows from the drive at the same time, plenty more of the drive’s power can be directed towards accessing files and backing up. Packaged with the DNS 321 is D-Link’s ShareCenter software. ShareCenter allows you to set a scheduled back up of all of your important files, or have it back up in real time, meaning anytime a file is changed on your computer, it is automatically sent to the DNS321 for safe keeping. ShareCenter also has a unique snapshot feature, allowing you to take “snapshots” of your computer at different times. That means if something ever goes wrong with your computer, the D-Link’s snapshot can help you restore your computer back to exactly the way it was when things went wrong. It sometimes feels like beating a dead horse when the transfer speed of NAS devices comes up. D-Link’s innards (we’re talking CPU and RAM) were designed a few years ago to handle 100mB/s networks with ease. And luckily, they still do. But as networking became faster and more and more businesses started opting for gigabit connections through their office, the DNS-321 didn’t grow with it. The DNS has a gigabit network card built in, but you can’t fully optimize its possibilities because of a hardware limitation elsewhere. We really like the D-Link and think it’s a great home use product for people not running gigabit lines through their home. The ability to add your own hard drives and ultimately decide how much power the drives are using was a huge plus, considering how energy conscious people are these days. For about $160, you can’t go wrong.